This USB 3.0 Dual Display Adapter convert USB 3.0 to two graphic outputs: DVI-I and HDMI. It enables you to connect two other monitors, LCD or projectors to a computer with a USB 3.0 / 2.0 port. It can be used in your office (for graphic designer, financial department, ...), you can use it for making multiple screen presentations, on fairs or for your home-use (entertainment). Adapter supports resolution not only up to Full HD 1920x1080 pixels, but also up to 2048x1152 pixels. 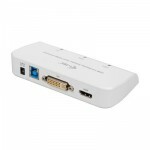 Owing to included adapter it can be used with devices equipped with VGA connector (LCD, Plasma TV, etc.). This USB 3.0 Dual Display Adapter enables you to connect two more monitors, LCD or projectors to a computer with a USB 3.0 / 2.0 port. For desktop users adding the extra monitors via USB connection is easier than ever without having to open the computer chassis to install an internal video card. Once the installation is done, the USB-attached monitors soon wake up. No function key hassle to swap a second monitor. The adapter is USB 2.0 backward compatible. You can use both HDMI and DVI-I interface to add another displays. In case you need to connect SUB-VGA display you can do so with DVI-VGA adapter which is included in the package. HDMI interface enables you to transfer video with sound together. On the other hand DVI-I interface you can use especially for connection to professional diplays with the highest resolution support.